I have a generous list of places that I want to visit in my lifetime that I consider to be pilgrimages. These are magical environments that inspire wonder and awe for me. Many are natural, and some are man made. Las Pozas is a combination of both. 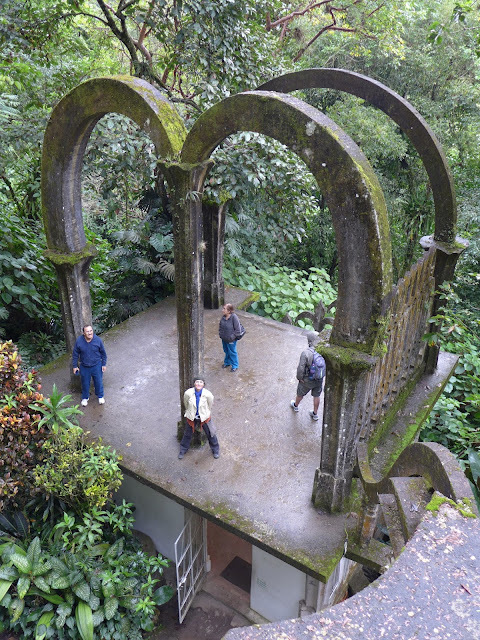 Inspired and financed by the British millionaire Edward James, Las Pozas is an extravagant surrealist architectural landscape blended in to a tropical paradise in the Sierra Madre Oriental Mountains of southern San Luis Potosi State in Mexico. James inherited an enormous fortune from his father at the age of 25. He claims to have been attracted to the world of surrealism because of the severity of his British upbringing, escaping the confines of society by imagining alternative realities. He studied at Eton and Oxford, published volumes of poetry, and became a patron of surrealist artists, including Salvador Dali and Magritte. Over time he amassed what was considered the largest private collection of surrealist art in the world. Being somewhat disillusioned with British society, James came to the United States and then moved to Los Angeles, which in my experience is not the best place to escape such a predicament. While there he found a guru who chastised his wealth as a barrier to spirituality. 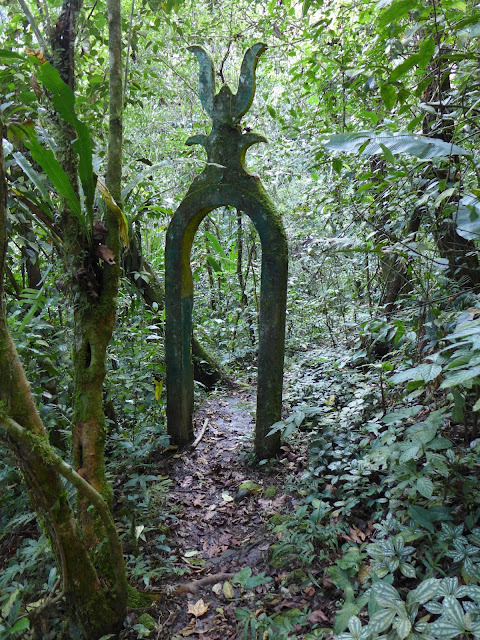 Under the encouragement of his cousin, the artist Briget Bate Tichenor and psychiatrist Eric Fromm, he came to Mexico in 1941 in part to search for a place reminiscent of the Garden of Eden. After arriving in Cuernavaca, which had a substancial well to do American community, he hired as his guide Plutarco Gastélum, a man who worked in the telegraph office. He bought two sleeping bags, and they set out in a car to explore the country. In November of 1945 they came upon the town of Xilitla, a mountain village at 2,000 feet in elevation surrounded by lush jungle, southwest of the Gulf coast city of Tampico in the Sierra Madre Oriental. Gastélum later met a local woman, married, had four children, and built a a surrealist Gothic home in Xilitla. The house is now a hotel, La Posada El Castillo. One would think the name refers to a castle, but it actually derives its name from being built on the site of the home of Colonel José Castillo, an officer in during the Mexican Revolution. Edward James would come to Mexico for two months every summer and stay with Gastélum's family, whom he adopted. 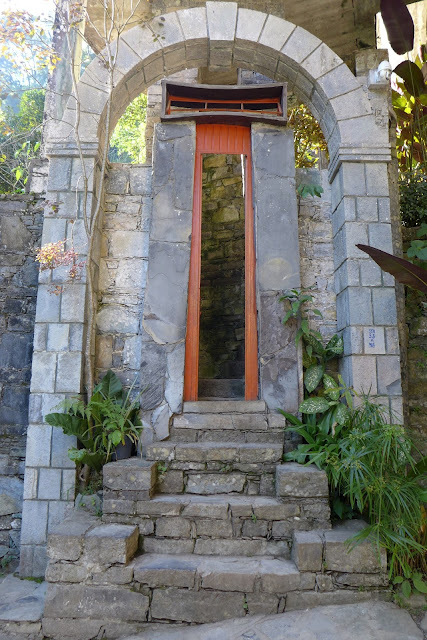 The house had the town's only swimming pool, lush gardens, and fantastic architectural details that were expanded at the same time as Las Pozas. James sent Gastélum and his wife Marina on a tour of Europe that inspired the Gothic elements in the house. 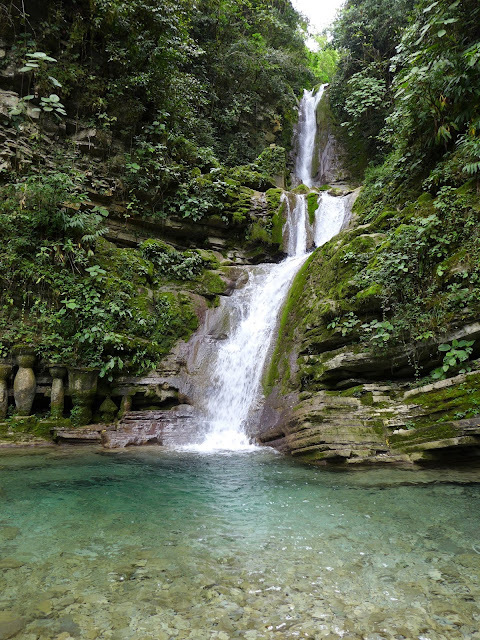 A couple of miles down in the valley from Xilitla lies a verdant paradise where streams cascade over cliffs in to pools. 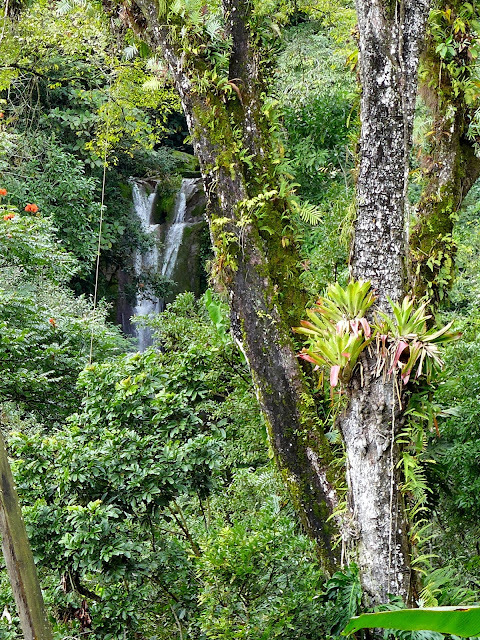 Pozas means pools in Spanish, hence the name of the garden. 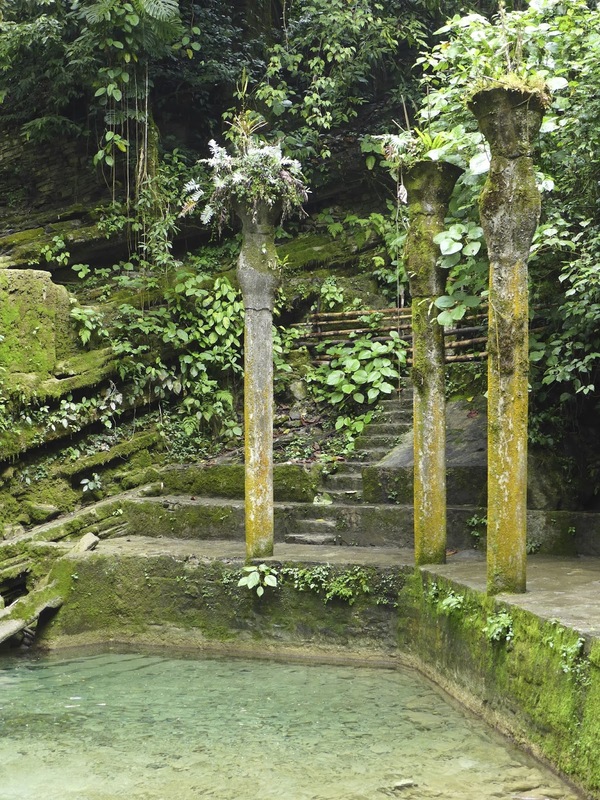 James frequently went to the pools to bathe and was known to pay the locals to allow him to enjoy the place in solitude, but as he developed the gardens, the local people to my knowledge were never excluded. The property was a coffee farm called Rancho La Concita. At first he collected orchids and animals, and amassed as many as 29,000 orchids, most of which were killed in a freak snow storm in 1962 while James was in New York. People in the area had never seen snow before and called it 'white ash'. The death of so many plants triggered the decision to build concrete sculpture in the garden for its permanence, something that couldn't be killed. In the end the garden covered an expansive 80 acres of steeply sloping land. 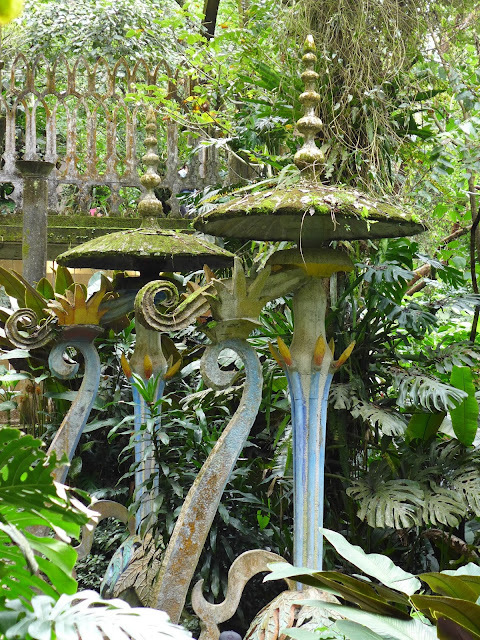 As I began to do more research on the gardens in order to write this photographic essay, I found that there has been a fair amount written about Las Pozas. There are also two documentaries, one of which I have linked here. 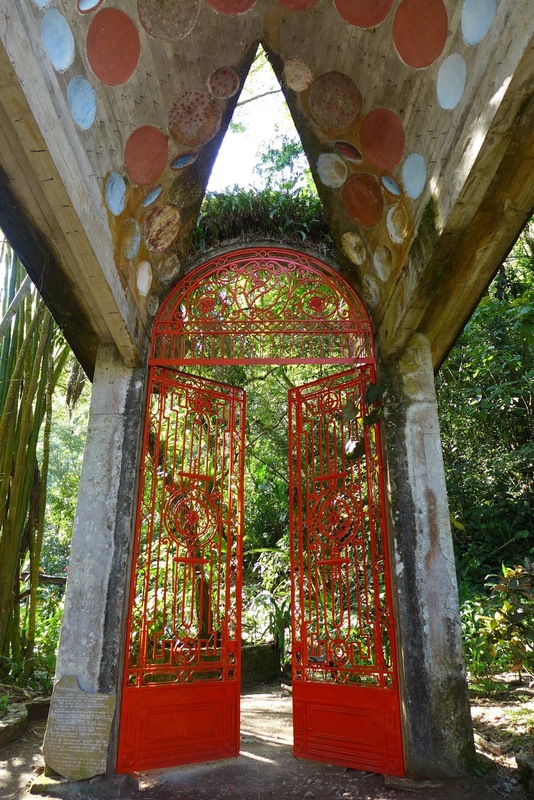 The film covers the very interesting life of Edward James, from his childhood, education, inheritance, and career as a collector of surrealist art, to the manifestation of Las Pozas. The film is nearly an hour long so you may want to watch it first and then begin the photographic journey through the gardens. I also found a wonderful BBC podcast which I recommend you listen two while you scroll down through the photos. When you first enter the gardens, passing the restaurant, a path winds above the stream to a series of bathing pools. The path becomes restricted by two walls and then opens up to marvelous terraced pools and diversion channels puctuated by towering columns and undulating arches. While I opted not to do a guided tour, I passed and listened in on some of them over the 3 days that I spent in the gardens, and overheard one in Spanish saying that there was once a trampoline you could jump on to plunge in to one of the pools. There are remnants of diving platforms jutting from the cliff as well. The pools must have silted up as they seem too shallow for diving now. 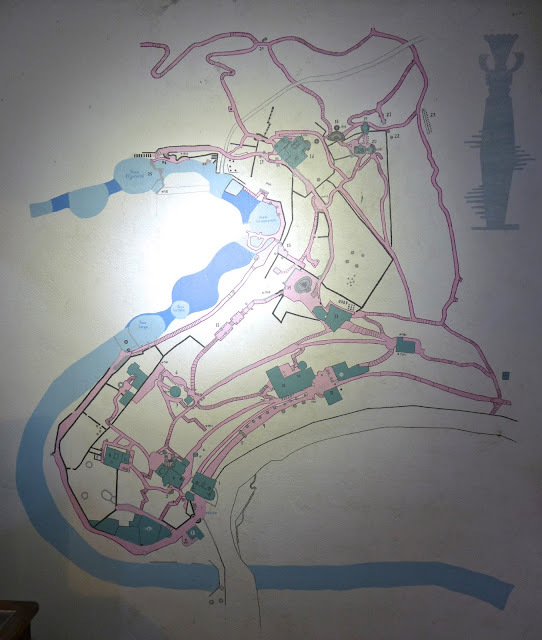 It is no longer possible to reach the upper parts of the garden from this area, so we backtracked to the entrance and entered what is an amazing endeavor of decades of work and millions of dollars in investment, a world unto itself. Nothing was ever really completed at las Pozas. 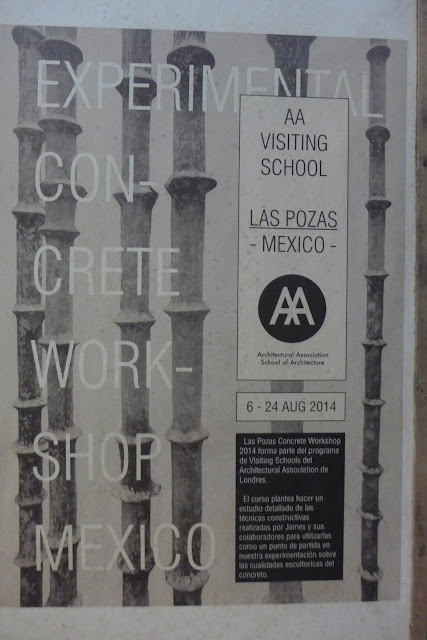 Like many Mexican constructions, rebar protrudes from the tops of columns and platforms for the purpose of adding new layers. There is a structure called "The House on three floors which will in fact have five or four or six." One of the largest structures here is called the Cinematografo. Because of some deterioration and the dizzying heights achieved climbing ever higher without hand rails it is unfortunately no longer open to the public. It was meant to be used for projections of film, light and color. Las Pozas had electricity run to the garden in 1979 and was lavishly illuminated. Passing the Cinemagrafo, a verdant cobbled path leads to a circular gate called Reja Circular Anillo de la Riena, or the Queen's Ring Gate. The bold color and form of the tropical foliage plants along the paths are wonderful. There is no real sequential progression to moving through the garden. 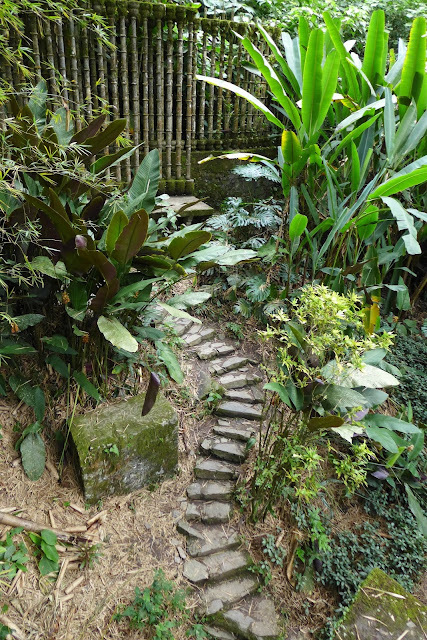 It is possible to turn in to a narrow passage or doorway at many points and enter a labyrinth of optional paths. Twisting stairways lead to unknown destinations, sometimes bringing you back from where you just came. Such is the nature of the intended surrealism here, to disorient and confuse and delight the mind. Edward James would do sketches of his ideas, working directly with carpenters who would build wooden forms in a woodshop beneath open cabanas and platforms. Because of a lack of engineering skill, extra rebar reinforcements were used to increase the integrity of the structures. Concrete was poured in to the molds by masons and compacted and then the forms removed after the concrete had cured. The surfaces would be finished and sometimes painted vivid colors. The majority of the installations remain solid after half a century in the jungle. 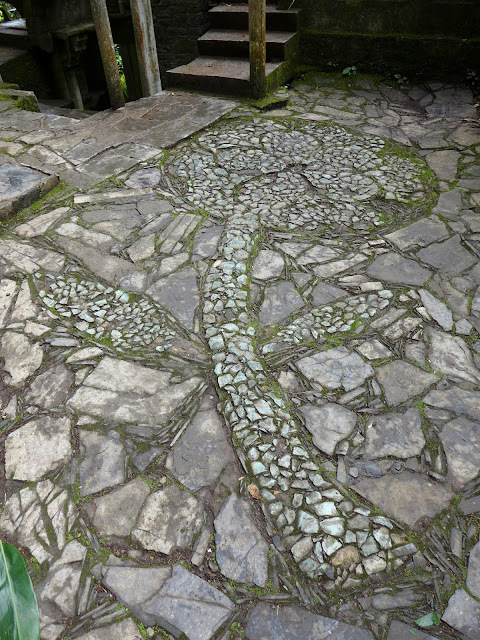 Twists and turns and narrow gaps open to small patios punctuated by pillars and platforms. The slopes and multilevel structures are linked by a wide variety of steps, often suspended in space. 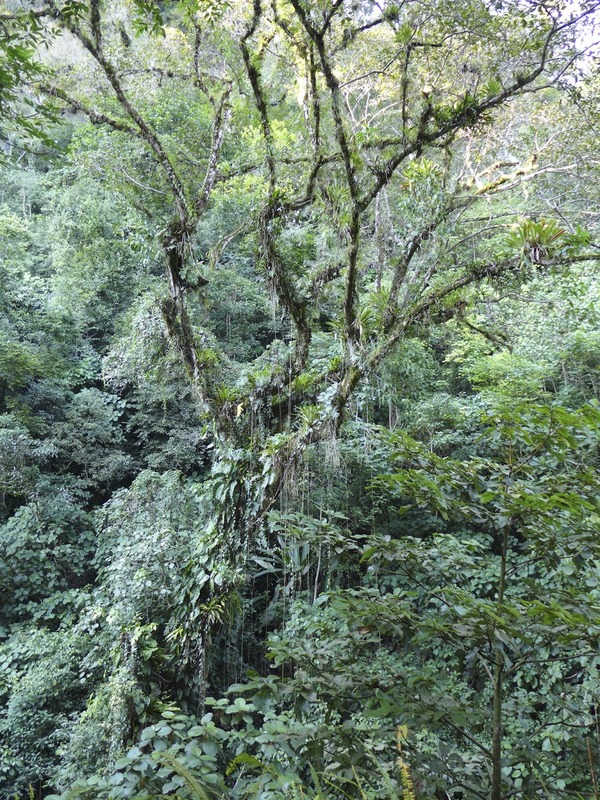 Giant leaved plants play dramatically off the sculpted forms they surround. The forms of many of the sculptures play on the botanical patterns of the jungle. 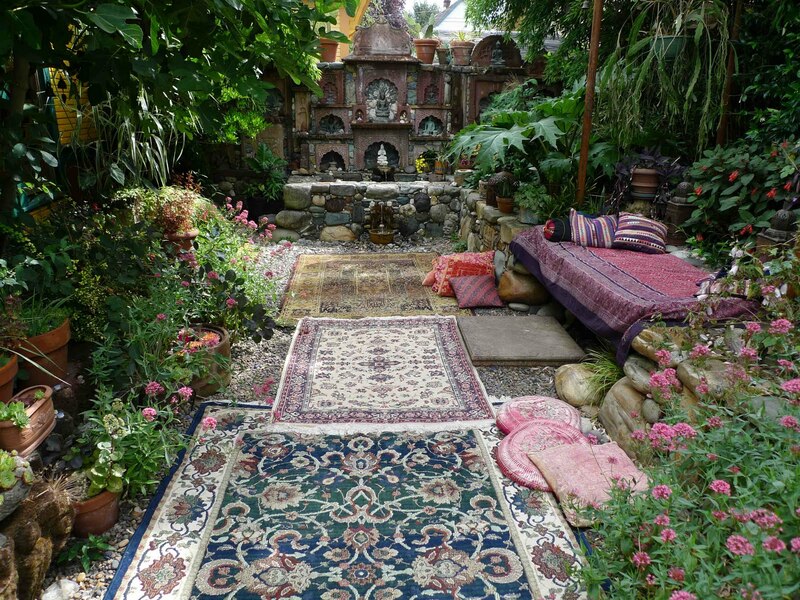 At the base of a cabana are a pair of sculpted hands by which the garden was created. I've also made mosaics of my hands to honor the hard work they have endured to build what my mind imagines, so I was particularly taken by these sculptures. Structures blend beautifully with the jungle. 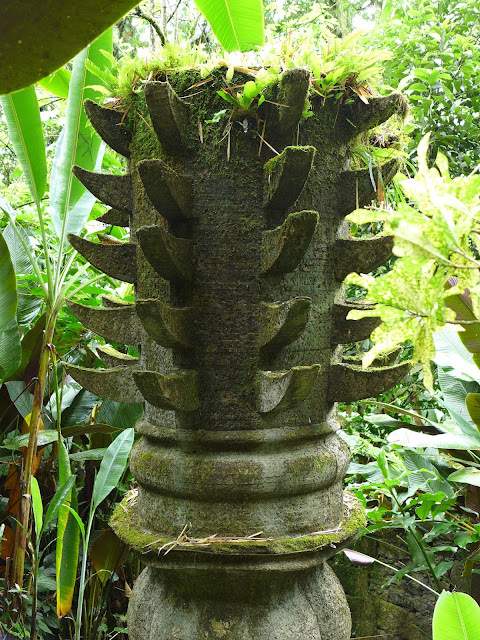 One of the inspirations at Las Pozas were the ruins at Angkor Wat in Cambodia, where magnificent architecture is wrapped in the roots of trees and vines. The intricate network of paths and stairs make it possible to explore the steep slopes of the jungle with relative ease. Maneuvering the difficult terrain carrying tons of building material was a major task for the many workers who built the garden. Edward James was a lover of animals. Being a wealthy eccentric put him in an awkward position socially. He found the company of animals to be easier to navigate and collected a large variety of creatures which he housed in a sculptural zoo. Here he could come and feed and talk to his white tailed deer, the ocelots, snakes, and many parrots and macaws. There were pools for crocodiles and flamingos, and plans for an aviary that never came to fruition. There are a number of cabanas where people could stay, and a significant building in the center of the garden that looks more prominent than the others. I overheard a guide (the son of Plutarco Gastélum) saying that James had hoped to be buried there and that for this reason the pillars under the first level are painted white, although the levels step up in half stories. There was a bedroom, living room, and terraces for him to stay in and oversee his creations. James wanted to bring his friends Alfred Guinness of Brewery fame and fashion icon Coco Chanel to visit his creation and had various dwellings built although their surrealist nature made them rather strange to inhabit. 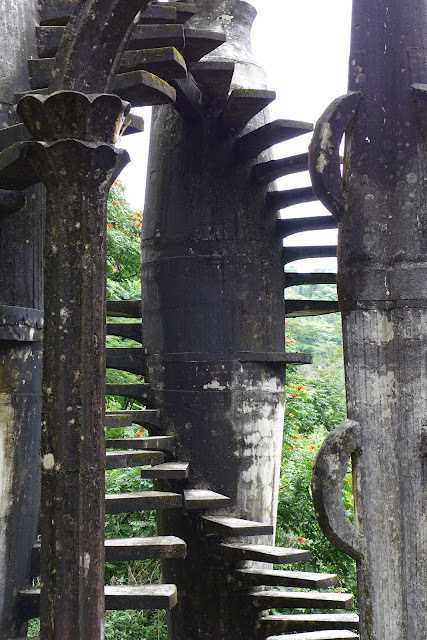 The ravine above the House on three floors has a number of folly like structures including the delicately soaring Palacio de Bamboo, The House with a roof like a whale, and the Bathtub shaped like an eye. Above these is a bridge that arches out to nowhere, and a lovely double bamboo screen. 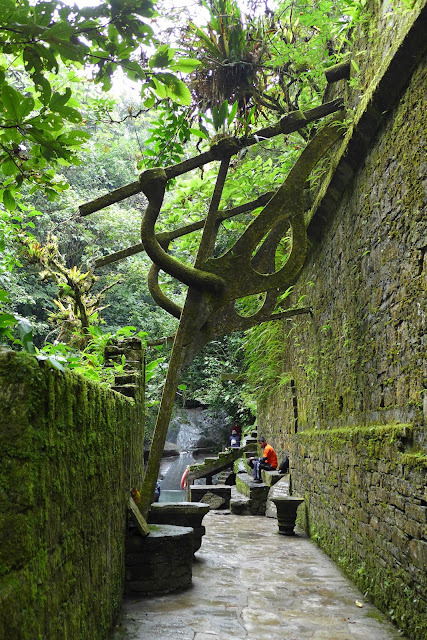 A path leads back down to the stream, where a series of terraced pools are connected by small cascades. There are trails higher up on the hill above the double bamboo screen that I wanted to explore, as I was sure you could climb up to the top of the highest waterfalls. On the third day I was there it was warm enough to swim so I climbed the stairs to a place where they had collapsed, but I was able to work my way up. Even up here there are walls and arches and sculptures in the dense jungle. I came to another wall with a round gate and then the path became a tiny track leading down the bank to the stream again. I came upon an overgrown stone table, and stairs leading up the opposite bank. Few people come up here and it feels wild and undiscovered. I had found paradise. It was wonderful to bathe in the clear pools after two days with cool weather. There were pebbles up here, so I couldn't help but make a small mosaic in the water, as I didn't want to leave. So I spent the rest of the afternoon exploring the upper parts of the stream. I didn't want to get lost in the dark so I made my way back down. Transport back to town is hard to come by and I ended up having to walk back to town. I always feel some kind of hesitance when I am leaving a very special place that I may never return to. Xilitla is an eight hour bus ride from Mexico City on winding roads over many mountains. If you cant make it then I hope this photographic essay is the next best thing. Edward James died in San Remo, Italy in December of 1984. As were his wishes, the garden was left to the family of Plutarco Gastélum. They continued to maintain it and made it available for the public to visit. 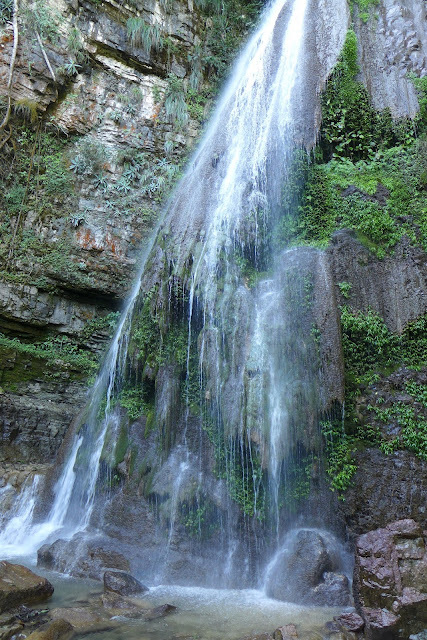 The Pedro and Elena Hernández Foundation acquired the gardens in partnership with the State government of San Luis Potosi for the purpose of preserving them. This prohibits building new structures in the garden or adjacent properties. It has been designated a State Cultural Heritage Site and is currently being reviewed by UNESCO for listing as a World Heritage Site. Since much of the work at Las Pozas is unprecedented, symposiums have been held in creative concete work and some interesting constructions have occured along the road where simple lodging and cafes are located. 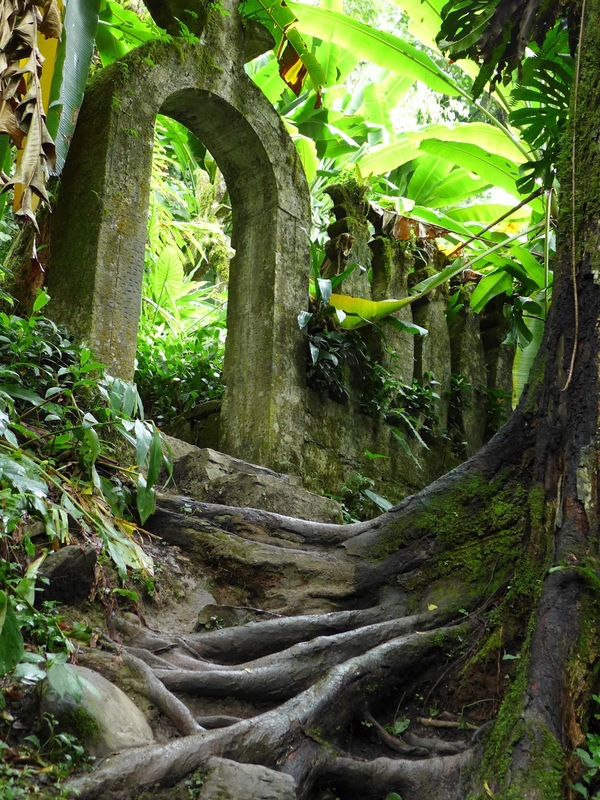 Such a pleasure to be able to make the journey to Las Pozas and experience its wonders with plenty of time to savor marvelous ambience. I feel blessed. http://altbuildblog.blogspot.com/2010/10/water-features-at-parque-eduardo-ruiz.html. Your blog posts never fail to amaze. Fantastic. Thank you for taking the time to document your trip and sharing it with us! Fascinating. Thank you, Jeffrey, for the beautiful photographs and for posting the video! A beautiful posting as usual Jeff. I'm sorry to hear they don't allow people up on the high steps anymore- I couldn't bring myself to do it, but watched a group of boisterous school kids jostle each other at the top- no personal injury attorneys in sight. And thanks for the link to the film about Edward James- I learned a lot from that. Happy travels. Fabulous post and commentary-history-photos as per your usual Jeffrey! ¡Muchissimas grácias!